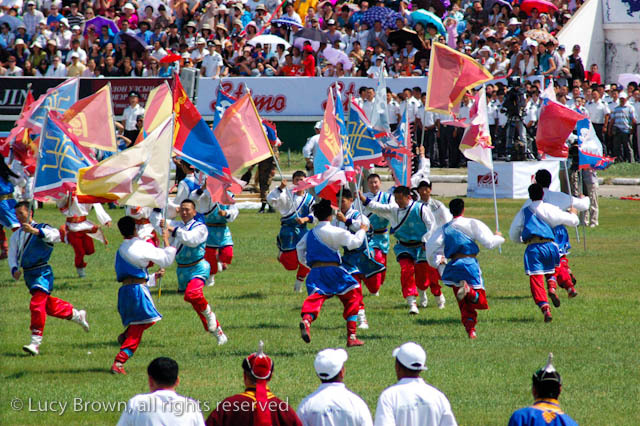 Nadaam or the “Three Manly Games” is the most important festival of the year in Mongolia and is held throughout the country during the national holiday from 11-13 July. 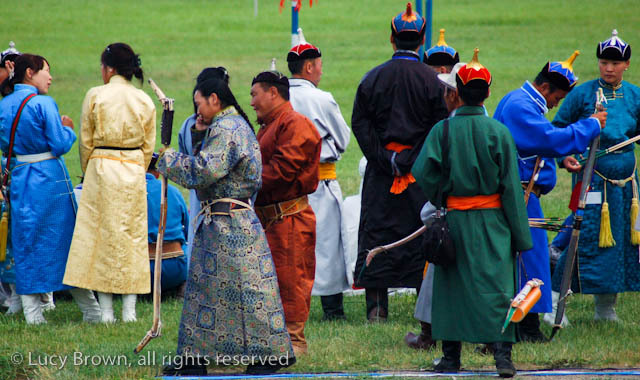 Its roots lie in Mongolian warrior traditions and includes competitions in wrestling, horse racing and archery. 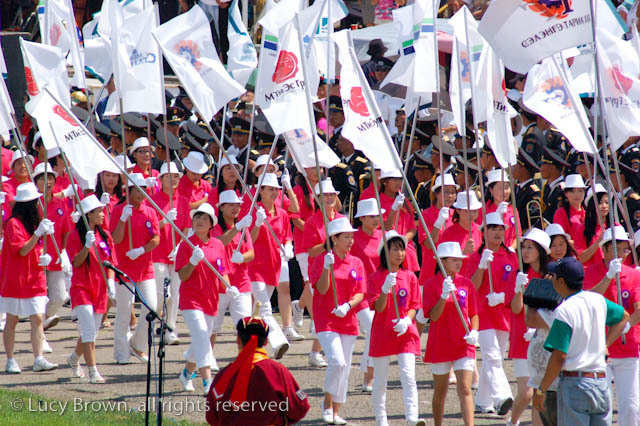 The National Sports Stadium in the capital Ulaanbaatar holds the biggest celebrations and opens with an extravagant ceremony of horsemen, athletes, musicians, dancers and the military. Then the contests begin. 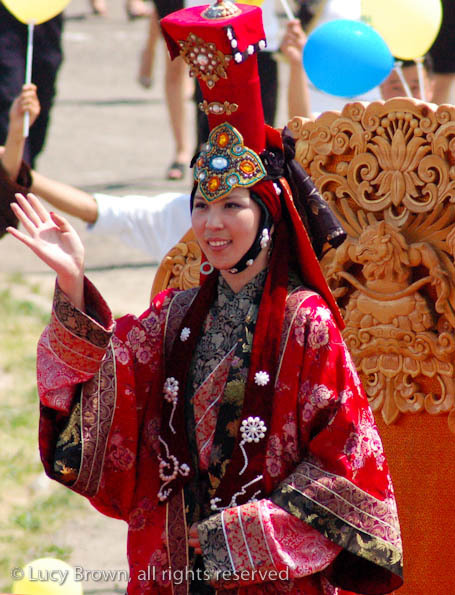 My brother Mike planned his wedding in Mongolia to coincide with Nadaam, giving guests visiting from other countries the chance to see this unique festival too. 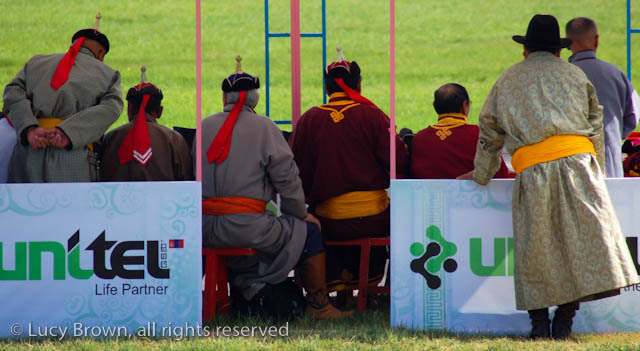 Officials in the stadium dressed in the national costume. 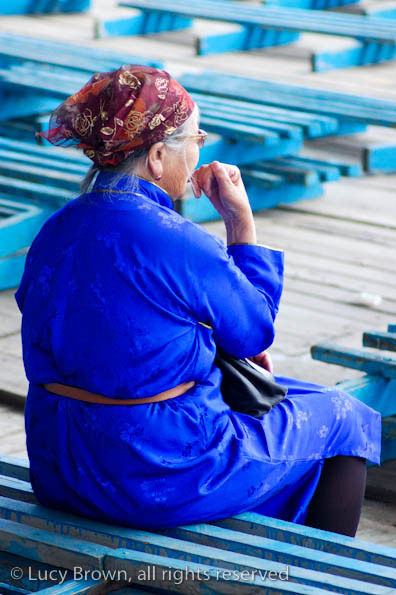 This robe-like garment called a deel is daily wear for many people in the city and out on the steppe. 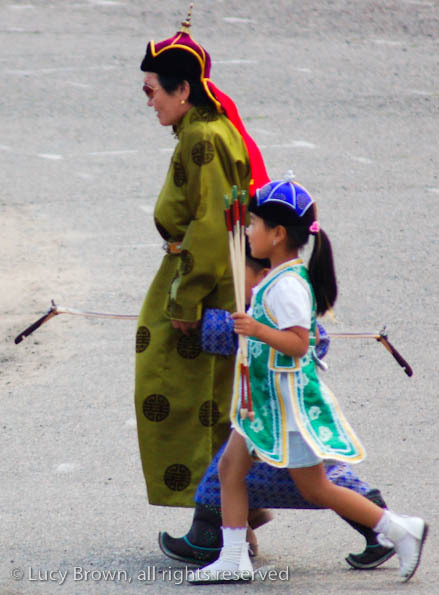 Old woman in national costume arrived before the crowds. 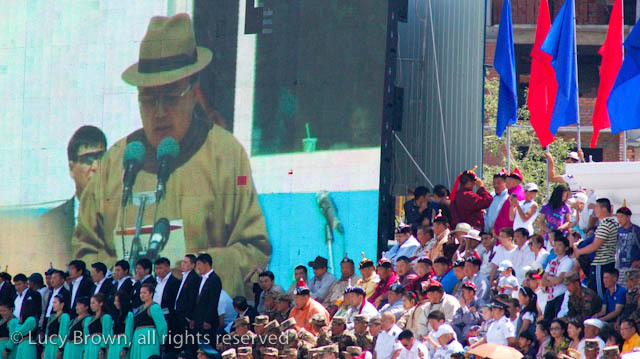 The President of Mongolia, Tsakhiagiin Elbegdorj, gave a speech during the ceremony which broadcasted to everyone on the big screen. 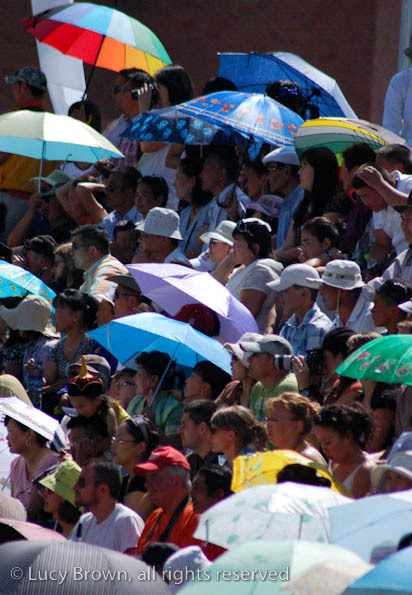 Spectators sheltering from the harsh sun under umbrellas. Archery display. 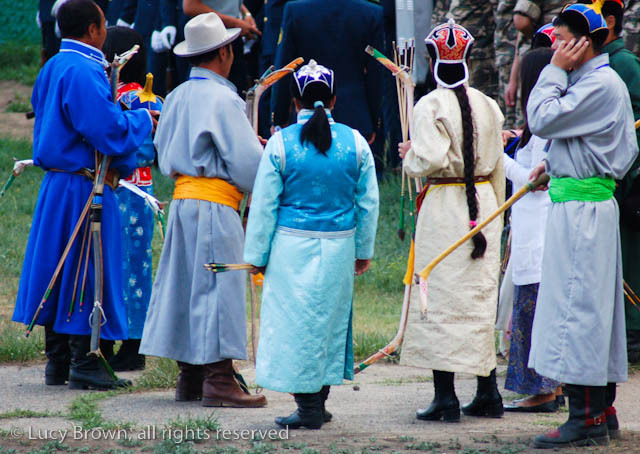 Both men and women compete in Mongolian archery and wear traditional costumes. 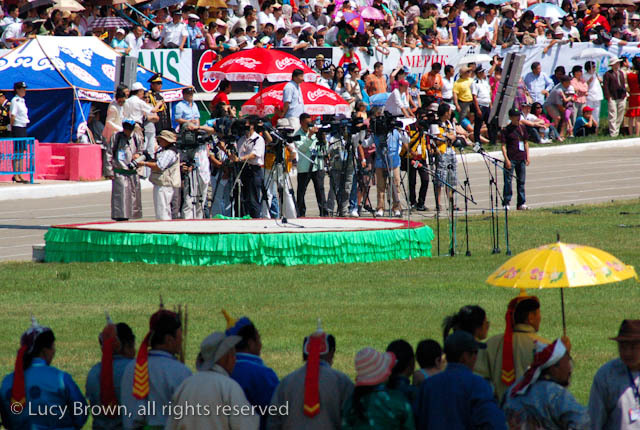 A multitude of film crew and photographers record the event. 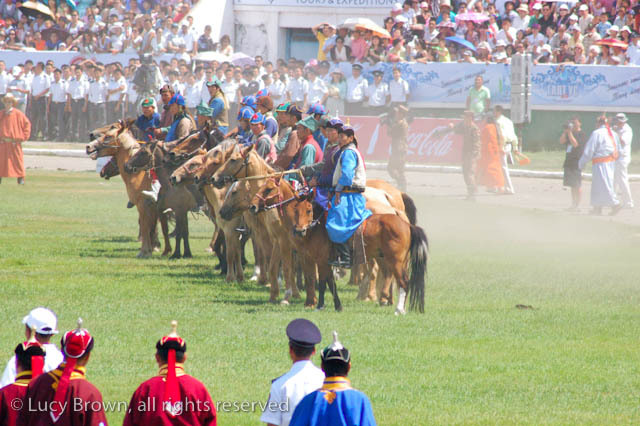 Horsemen show their skill galloping into the stadium in a cloud of dust. 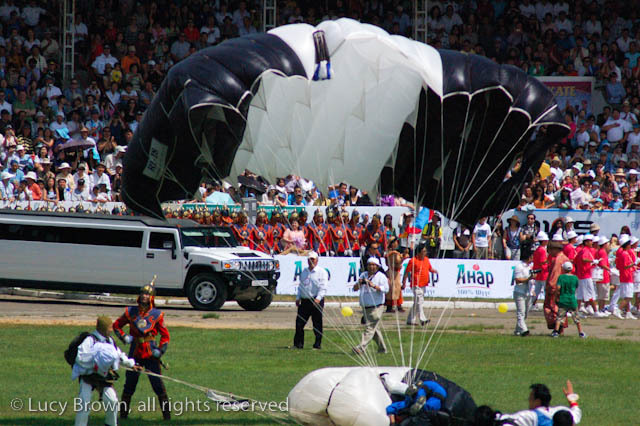 Parachutists landed in the stadium closely missing dancers. It was mayhem. 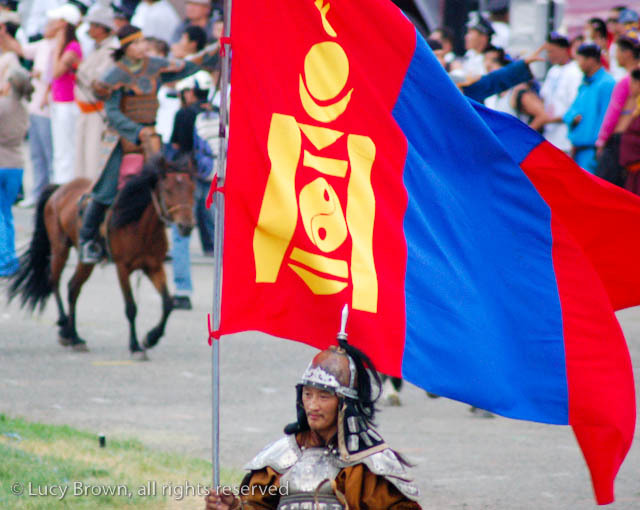 Horseman carrying the Mongolian flag. 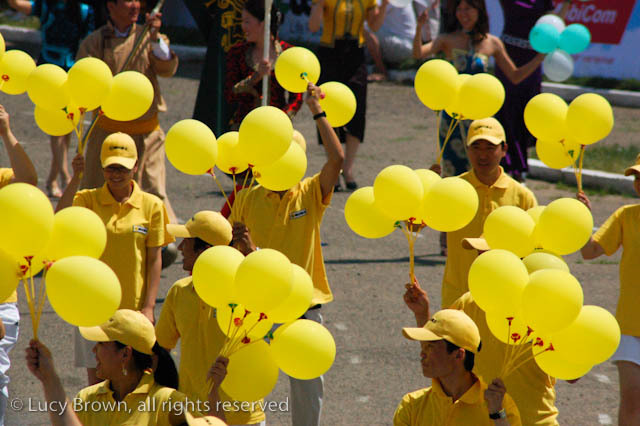 The yellow symbol on the left is the national emblem or the Soyombo seen everywhere. It has representations of fire, sun, moon, earth, water and the Taijitu or Yin-Yang symbol. 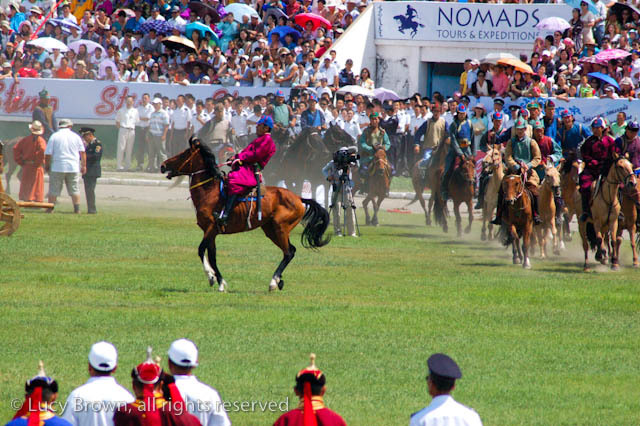 Check out my article Mongolia’s Three Manly Games in International Living Magazine and my other Nadaam festival blog posts Horse Racing on the Steppe and Mongolian Wrestling. 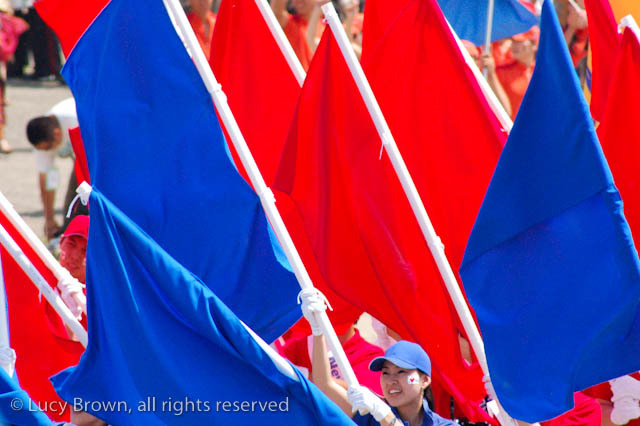 This entry was posted on November 27, 2010 by loca4motion. 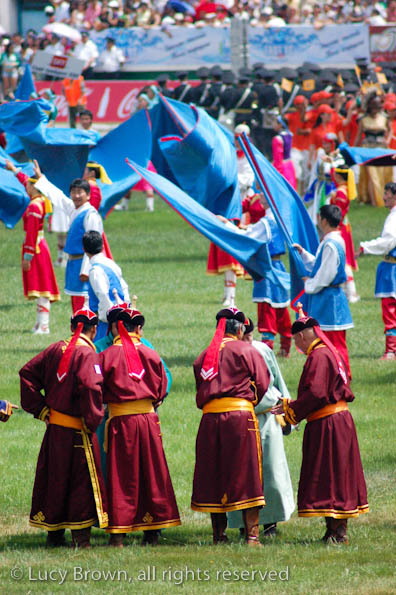 It was filed under Asia, Mongolia and was tagged with culture, festival, mongolia, mongolian archer, mongolian deel, mongolian flag, mongolian horses, mongolian soyombo, nadaam, photography, sport, traditional costumes, traditions, travel, ulaanbaatar. 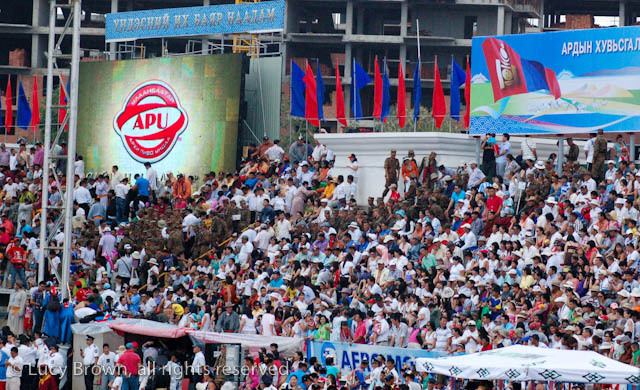 Really nice pics, gives a good feel of how it was like to be there. Looks like a great festival too! Thanks so much Mike. 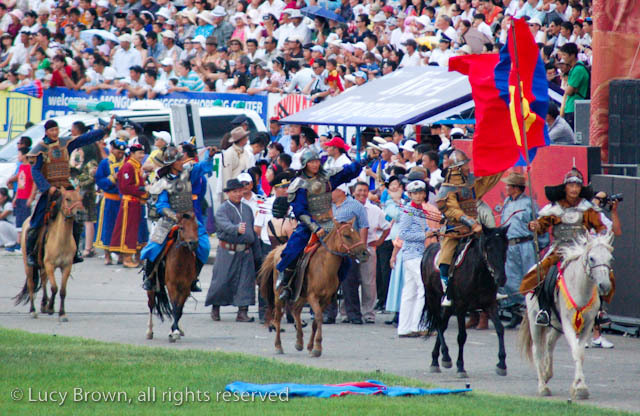 It is a great festival but I still haven’t posted what I consider to be the best part, the horse racing on the steppe! This was truly authentic! The dreaded Mongols (also known as ‘Mughals’ in Persian) reached and attacked my city, Delhi, a number of times in the medieval era. 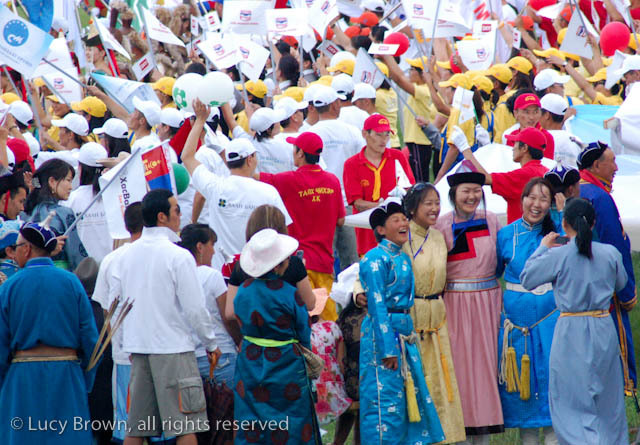 Fascinating to see what they would have looked like, from the old traditional costumes at the Nadaam festival. 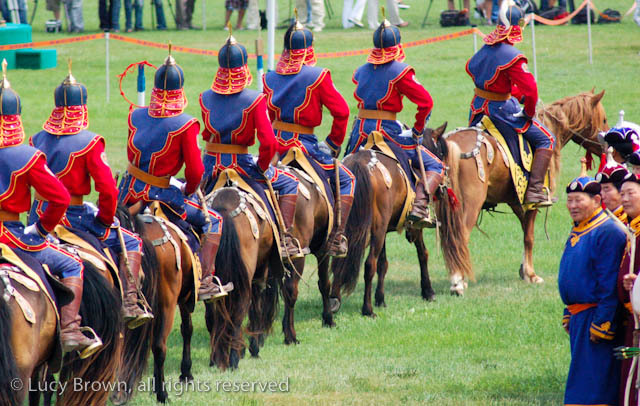 Equally fascinating for me from another aspect, because I’m a horse-lover and rider. Thank you so much Gautam Das! 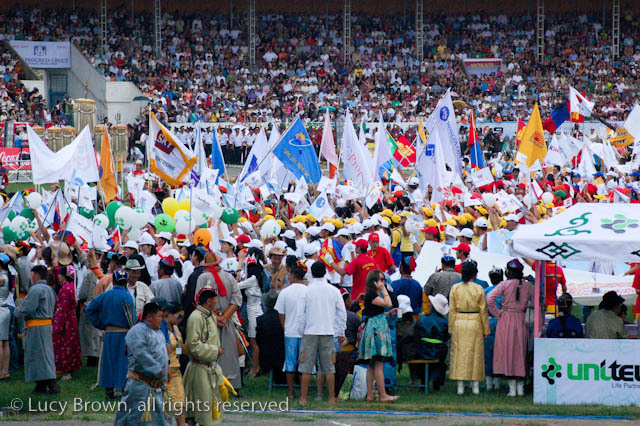 Nadaam was incredibly colorful and even today many Mongolians wear traditional dress, especially out on the steppe. 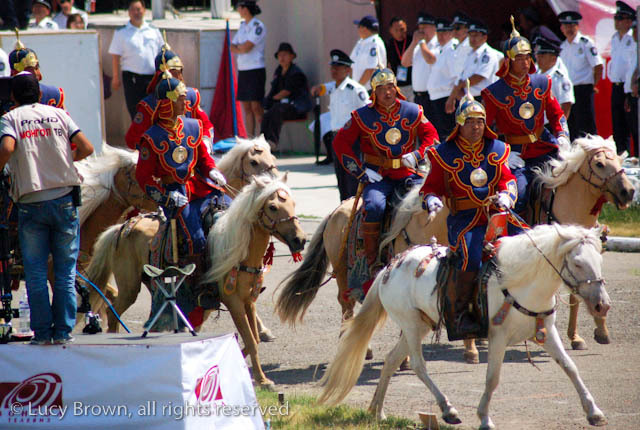 I’m also a horse-lover and rider so the horse culture in Mongolia was one of the most interesting aspects for me. I’d love to visit your city one day. I had no idea the Mongols reached as far as Delhi. I still haven’t made it to India but one day I hope to! Thanks for the reply, Lucy. Welcome to India! But beware; we live in a noisy, chaotic and sometimes smelly country, and the cities are almost all very crowded. Try and visit during our pleasant and mild winter (in the plains – this does not apply to the Himalaya Mountains), though the nights in December and January are cold even in the plains in nortthern India. We seem to share similar interests – the great outdoors, writing and photography, though I’m nowhere as accomplished as you evidently are. 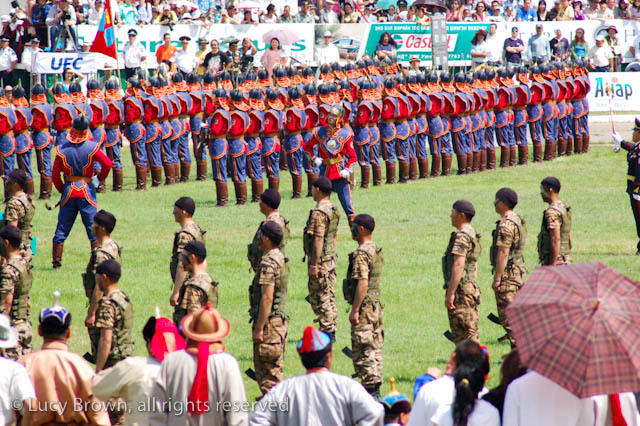 (I’m a former infantry officer of the Indian Army, and belonged to the Gorkha Rifles; now dabbling in both writing and in photography). More power to your pen, and to your camera! 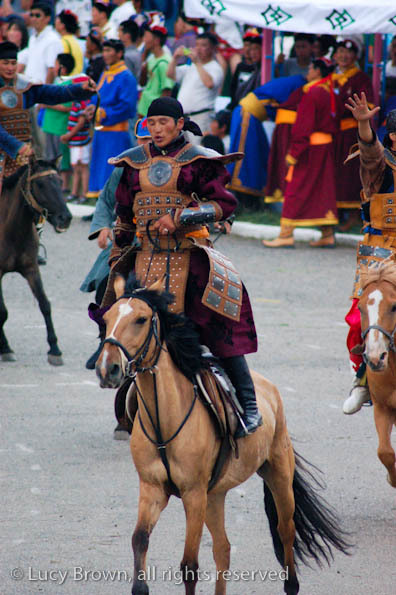 I’d love to do a horse-trek in the Mongolian steppe someday – the idea totally fascinates me. All the best, and God bless! Thanks for the recommendations Gautam. I really hope to make it there one day. Also, thanks for the compliments! It’s always good to know when my photography is appreciated. I used a very unprofessional Nikon D50 which I’ve had for a number of years and love but it’s almost time for an upgrade. 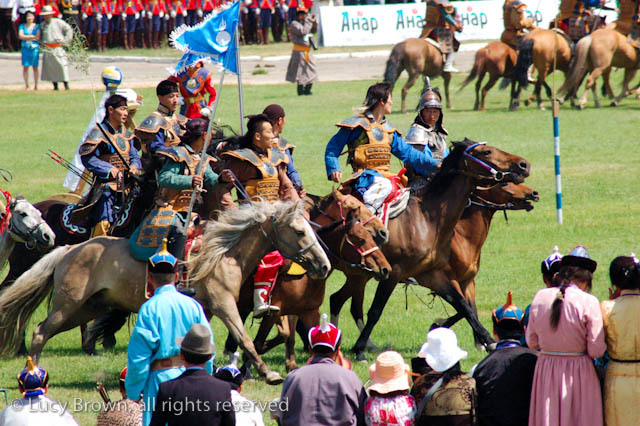 Unfortunately, I only did a two day horse-trek during the time I was out on the Mongolian steppe but it was incredible. I’d like to do a much longer one if I go back. Good luck with your writing and photography! You should start a blog! You have plenty of colorful material where you live! Just for the record: Chinggis Khan himself came into the Indian sub-continent in 1221, but went back into Afghanistan and didn’t return himself. 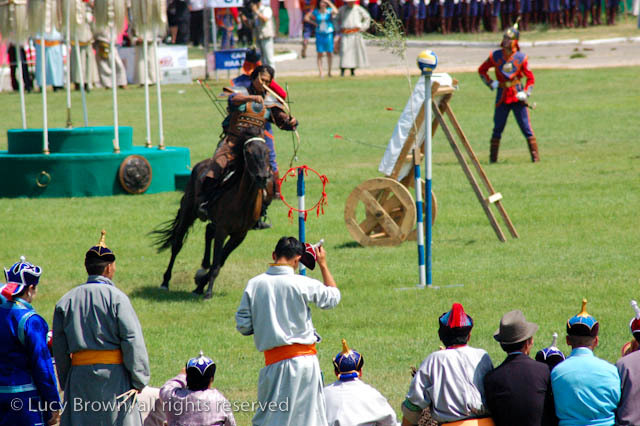 But for the next century Mongols repeatedly attacked north-west India using Afghanistan as their base, down to Delhi, which was besieged a few times but fortunately the city itself was stoutly defended and couldn’t be taken by them – though at times they were bought off after they defeated or by-passed the border forces and besieged Delhi. However the north-western province of the Punjab was actually captured a few times by them, with its capital Lahore (in today’s Pakistan)actually getting taken and razed once. 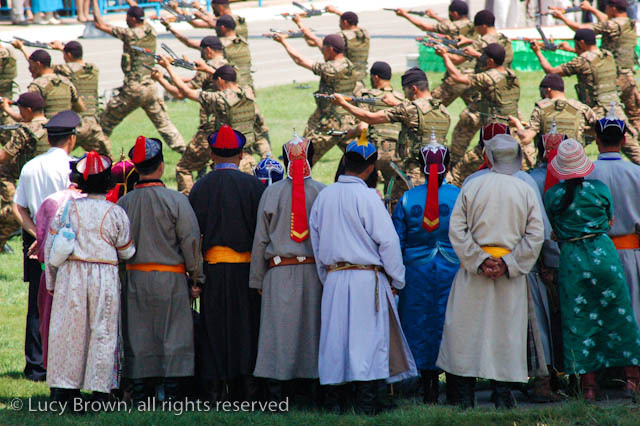 There folllowed a long period of border wars and skirmishes at the north-western frontier along the River Indus (now in Pakistan) with the Delhi king’s armies concerned principally with the Mongol threat. The last major Mongol threat to Delhi itself was just before 1321, after which a strong new fort (still standing, and just a few kms from my house) came up and was completed in 1325, ending the possibility of the capital actuall falling to the Mongols. Sometime during that period there was a truce (with Hulagu Khan then ruling Iran and Iraq) and the threat also declined. Do you use a zoom with your Nikon D50, or shoot with a fixed-focu prime lens? If a zoom, what is the preferred zoom range, or which particular model is yours? 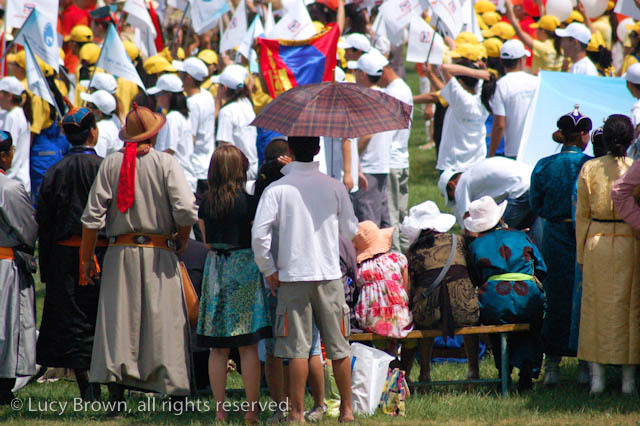 Just getting in some useful info, in case I can manage a trip to Mongolia nest summer (2013). Hi Gautam, I’m impressed with your knowledge of history! Thanks for that. 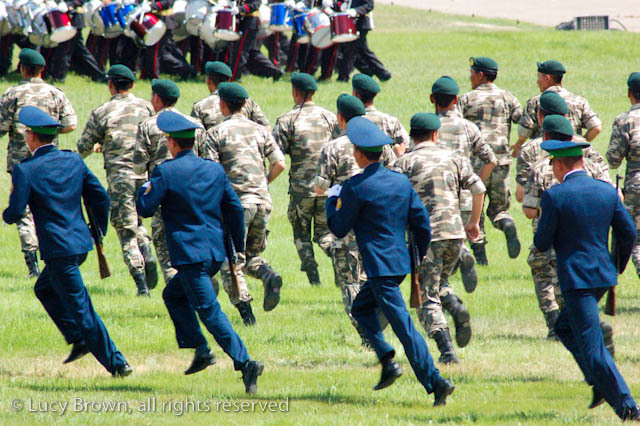 I shoot mainly with a 18-55mm 1:3.5-5.6 kit lens but also have a Tamron 70-300mm 1:4-5.6. Nothing fancy. 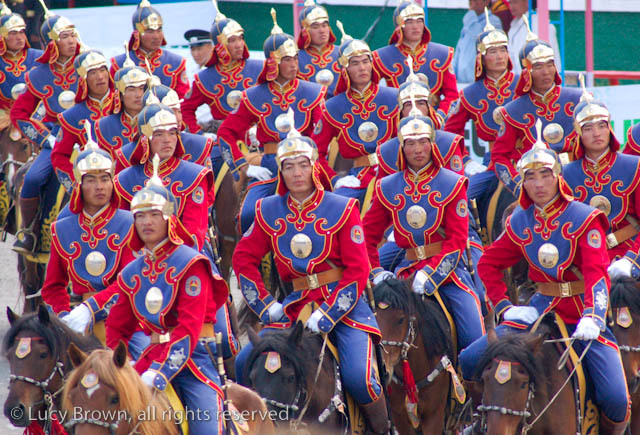 Good luck with your plans for Mongolia! I’m sure whatever camera you shoot with you’ll get some great shots! Thanks for the info re the lenses you use – info from an actual user is always useful; more so since I’ve seen the results – your great pics. It’s my pleasure Gautam and thank you so much for your kind words. I wish you all the best too and hope one day to see YOUR photos on YOUR blog!